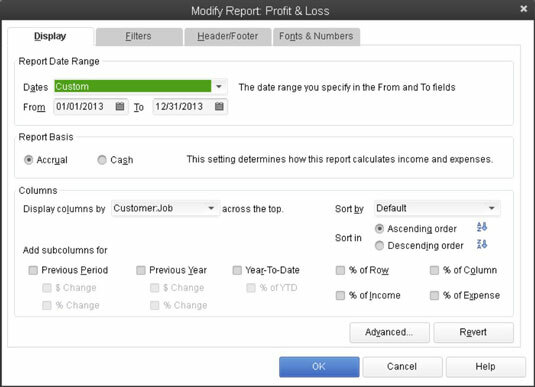 If you click the Customize Report button, QuickBooks displays the Modify Report dialog box, which you can use to customize a report. When you customize a report, you change the report’s appearance, layout, and the information that it summarizes. The Modify Report dialog box looks different for different report types. Nevertheless, if you look past the cosmetic differences, the dialog boxes pretty much all look and work the same way. The Display tab of the Modify Report dialog box lets you control the report interval date, the report basis, the columns, and some other formatting. The Report Date Range boxes — Dates, From, and To — do the same thing as the Dates, From, and To boxes on the Report window. These boxes let you control the reporting interval or accounting period. You can choose one of the date descriptions from the Dates drop-down list, or you can use the From and To boxes to specify a particular range of dates. The From and To boxes accept dates in the mm/dd/yyyy format. The Report Basis option buttons — Accrual and Cash — let you specify whether you want QuickBooks to prepare a report on a cash basis or on an accrual basis. Now you can’t simply convert between cash-basis accounting and accrual-basis accounting by clicking these buttons. Cash-basis accounting and accrual-basis accounting are too complicated for QuickBooks to figure out on its own. If you use accrual-basis accounting, for example, you must use the QuickBooks Accounts Payable feature, and you must record revenue and expense transactions when you earn revenue and incur expenses. Nevertheless, these Report Basis buttons enable you to quickly flip between cash-centric profit statements and accrual-like financial statements. And that’s pretty handy. In a nutshell, cash-basis accounting counts income and expense when cash moves into and out of a business. Accrual-basis accounting counts income when it is earned and counts expense when it is incurred. The Columns area enables you to control or specify how many columns a report should display. The Display Columns By drop-down list is analogous to the Columns drop-down list on the Report window. The Columns area also lets you choose a Sort By option. Again, this is analogous to the Sort By drop-down list in the Report window. In addition, the Columns area allows you to add subcolumns (you do this with the Previous Period, Previous Year, and Year-to-Date check boxes) and allows you to add percentages. The neat thing about these percentages is that you’re actually adding financial ratios to your financial statement when you do this. To show each line item on an income statement as a percentage of total income, select the % of Income check box. For more report formatting options, click the Advanced button. QuickBooks displays the Advanced Options dialog box. Use the Display Rows radio buttons to tell QuickBooks when it should or shouldn’t display rows of information in a report. Similarly, use the Display Columns radio buttons to tell QuickBooks when it should or shouldn’t display columns in a report. You can use the Reporting Calendar radio buttons to select the default annual reporting period. The default year can be a fiscal year (you set this option when setting up QuickBooks), a calendar year, or an income tax year. Click OK to activate these selections. To revert to the default display settings, click the Revert button on the Display tab.